Symbols*: Many animals surround the goddess. The wren is a bird of prophecy and can lend insight into possible future events. The snake is winding on the pebbled ground, leaving spiral impressions that serve as symbols of new pathways. The deer is a symbol of rejuvenation and rebirth. The light cascading through the trees emphasizes hope for a positive future; it also nurtures the earth with its illuminating powers. The ivy is a sign of fertility and new ideas. The twining roots provide a connection with earthly matters. Poppies represent newness and vitality. The fox is a messenger, but he can be wily. The mouse can represent hastiness. The rabbit offers intuitive powers and represents lunar attributes and fertility. The squirrel is industrious and is good at collecting the fruits of the earth. The butterfly represents transcendent thought. 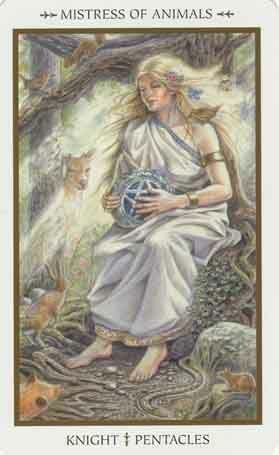 The goddess holds a disk decorated with a pentacle and swirls, representing the renewing qualities of the earth element. Description*: The Mistress of Animals is the goddess of wild animals of all kinds. She is the Great Earth Goddess and is the nurturer of all life. She can be found all over artefacts of the Minoan and ancient Greek culture. She is also known as Potnia Thero or “queen of the wild bees” and was connected with the Minoan Mother of Mountains. Eventually her image was assimilated into the Greek pantheon as Artemis. As Artemis, she was the mistress of wild nature and became a widely venerated cult figure. Often the Mistress of Animals is shown holding animals, symbolizing her divine influence or connection with the creatures. The birds that accompany her serve as messenger; the snake suggests her connection with the underworld; the surrounding poppies and lilies reinforce her fertile attributes. Her male counterpart is the Master of Animals, although he was not as widely recognized. Possible Meaning: The Mistress of Animals was connected with her wild nature and the earth element. She was a transitional goddess who metamorphosed over time. By remaining connected with our inner most wild nature, we, too, can boldly explore new opportunities for growth and personal metamorphosis. But there are times when we need to pause and enjoy some material comforts offered during moments of respite. It is important not to get too caught up in endless cycles of achievement. We should relax and enjoy our inner child by engaging in tasks that enable us to indulge in the fruits of our labour. Thoughts/Points to Ponder: She is a reminder of enjoying of the moment. Her talent is to quiet your mind, and to be still for a while, to just listen to the earth without thinking of anything else. “Live in the moment, be in the moment,” she tells me, and shows how she does before I do it with her. The animals of the forest has come to gather around her, as they fully trust her. Even though she has a wild side to her, most often than not, she is very peaceful and earthly. She is a free spirit, representing freedom which we all should have.